In my previous post, I began by introducing Pasha lying awkwardly at the bottom of our basement stairs. 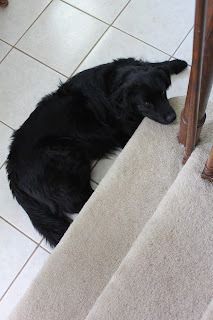 Like Pasha, our Lilah also likes to sleep at the bottom of the stairs, though in her case, we’re talking about our carpeted center staircase in our current home, with her head resting ever so gently on the last step. Walking down the stairs, I often have to step over Lilah, as she’s really Comfortable and doesn’t think it’s worth moving unless there is a possibility of going Outside or For a Ride. She’ll lie there and blink sleepily at me, trying to determine if circumstances require movement. And then there was Rosie, who believed that the stairs were nothing more than a series of perfectly sized Rosie Beds, each one offering a slightly different perspective on the world. She loved to sleep on the stairs, about halfway up, where, with a slight lift of her head, she could look out the windows in the living room or dining room or look in the hallway mirror to see reflected what was going on in other parts of the house. 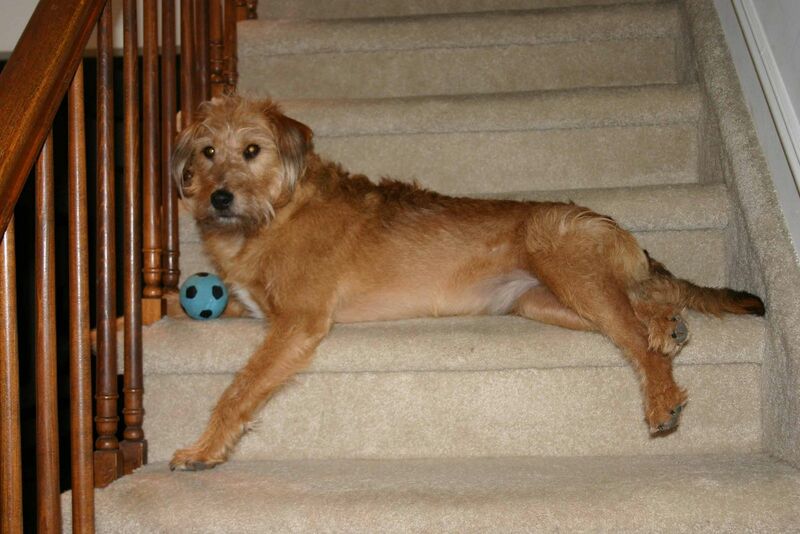 Rosie, on her favorite stair, with The Ball, of course. 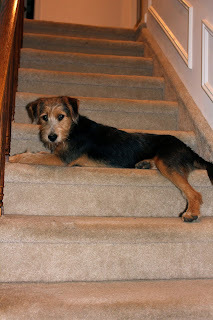 Recently, I found Tucker laying on the stairs just like Rosie used to; it was a bittersweet moment as I thought about my little girl who is no longer with us. 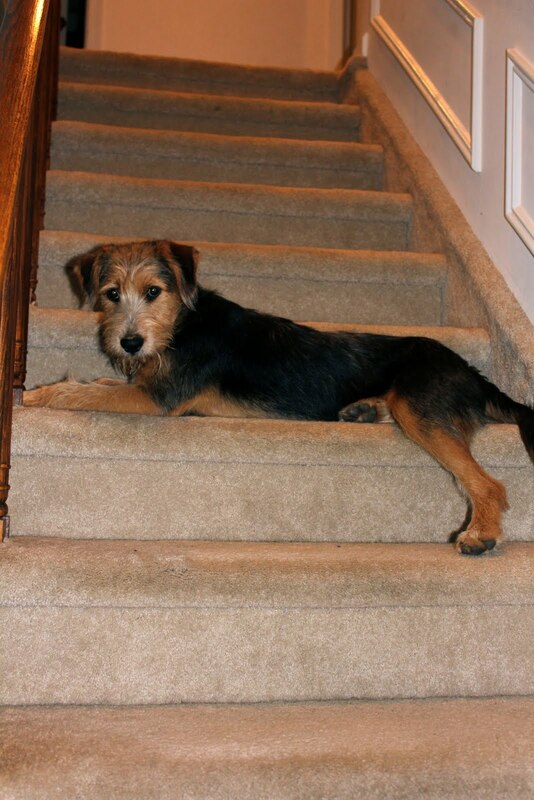 But Tucker hasn’t slept there since; I think the stairs were Rosie’s Special Sleeping Place--and not anyone else’s. That said, there are other sleeping similarities between Rosie and Tucker. 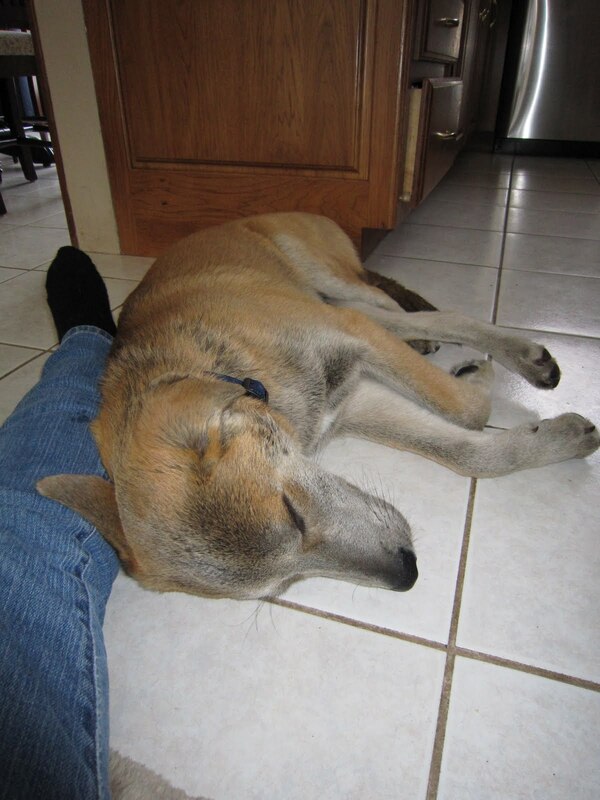 Rosie loved to sleep under the kitchen table with her head resting on the cross pieces of the table legs. In her absence, nearly every evening, Tucker settles into a similar spot. 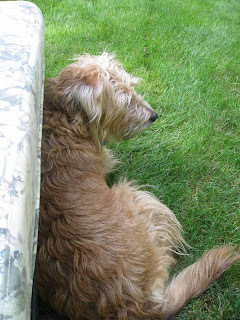 Rosie, though, would push her way under the table; I always felt her fur brush against me as she lounged against the pedestal bar. 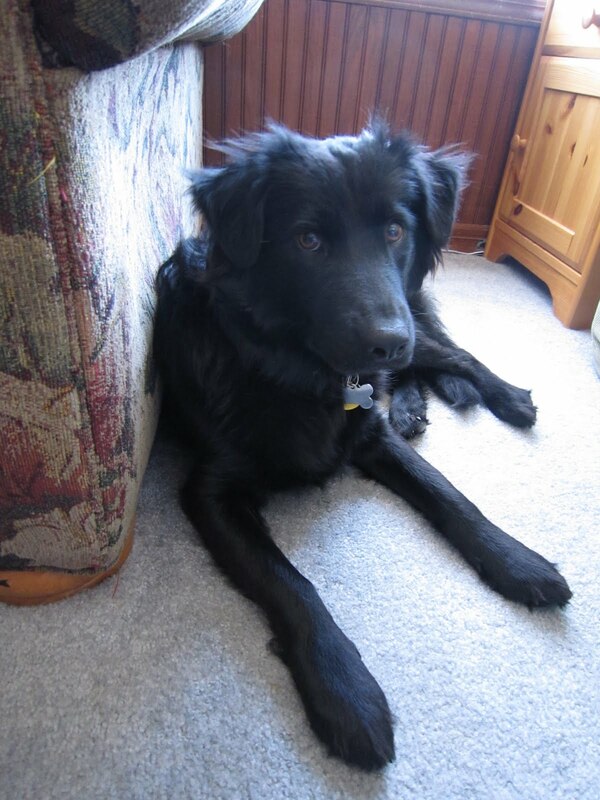 Tucker, however, manages to sneak under the table and lay right by my feet without signaling his presence. Often the first inkling I have that he is there is when I get up from the table and push my chair in and can’t figure out why it won’t move--until a small sigh of protest alerts me to Tucker’s presence and I apologize profusely for smushing the chair into his little furry body. And just the other day, Tucker sneakily squirmed his way under my desk and fell asleep in the kneehole--and I still have no idea how he managed to do it without me noticing. I think part of the attractiveness of Under the Table is the pedestal bar that the dogs can lie Against. Come to think of it, I think Against is one of the most common sleeping positions for all of my dogs. Both Jasper and Tucker love to sleep Against the family room couch. Lilah likes to sleep Against the family room chair. In the living room, I’ve seen all three dogs line up, sleeping Against the sofa and love seat there. My dogs have slept Against walls, Against the kitchen island, Against our bed, Against their beds (not in the bed, but Against), Against the closet door (Jasper), Against me, and Against each other. Tucker and Jasper Against the island, all in a row. Lilah and Jasper, Against each other. In our previous house, the dogs were allowed to go up on the couches and chairs. Pasha only slept on the futon couch in the family room. Kelsey, though, thought one of the best Sleeping Places was on the arm of the couch; it was quite wide since the arms were giant pillows. Unfortunately I don't have a picture of this, but a good visual image would be the stone lions that stand guard by the stairs of the New York Public Library. Lilah on the window bench, hanging out like the cat she is. The other cats on the window bench. Tucker sleeps on the couch every once in a while. But Jasper, the Comfort Hound, well, he owns the couch. It doesn’t matter how many people are on the couch, Jasper will find the tiniest of openings and just kind of squeeze and pour his long lanky body into it. Somehow--and we’re never quite sure how he does it--Jasper managers to start small on the couch, but expand over time, until there’s barely enough room for him and one single human. And of course, Jasper needs a pillow for his head, though a human lap may be substituted in a pinch. The couch is for dogs, right? Lilah, Tucker and Jasper get comfortable. Dogs and a cat (Dawn) sleep on and around me, on the couch. Speaking of laps, it almost goes without saying, but for Dawn and Athena, a lap is really the Most Special Sleeping Place. From what I understand from the two of them, a Lap is an Inalienable Right for Cats. Both of them will, when the mood strikes, demand access to a Lap, with all sorts of plaintive mews and sad cat sounds. If a Lap is not forthcoming, the demands may get louder, or the cat at hand may stomp off into another room looking for a more responsible and responsive lap. (I swear, if, before I had cats as pets, someone told me that cats can stomp, I would have laughed. Really.) The best Lap, of course, is the one the belongs to a person who is busy, preferably working on something really important, more than likely with a keyboard in front of her. Sometimes, if a Lap isn’t available, and it’s cold in the house, a Very Good Special Sleeping Place is what we sometimes refer to as The Dog Warmer. Though it is nothing more than a fluffy dog bed folded in half (for added height and comfort), it happens to be situated directly in front of a heating vent. In this case, the real estate adage about the importance of location truly applies. 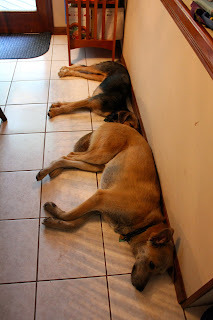 Both dogs and cats take advantage of the warm air that flows from the vent. Of course this only works for about half the year; in the summer, when the cool breeze of air conditioning blows over the bed, it loses some of it's attractiveness. Dawn (and Athena in the background) on the Dog Warmer. No surprise to folks who share their lives with cats, Dawn and Athena are often in search of Warmth. 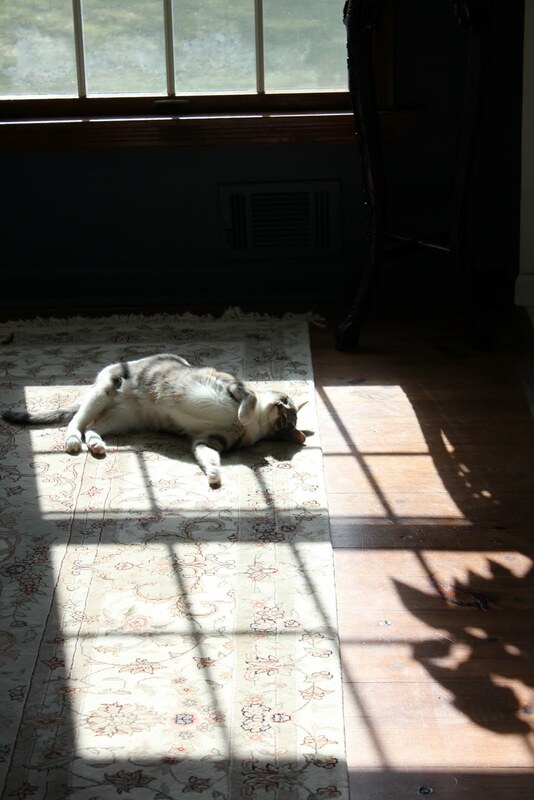 A patch of sunlight makes any spot in the house an instant cat bed. 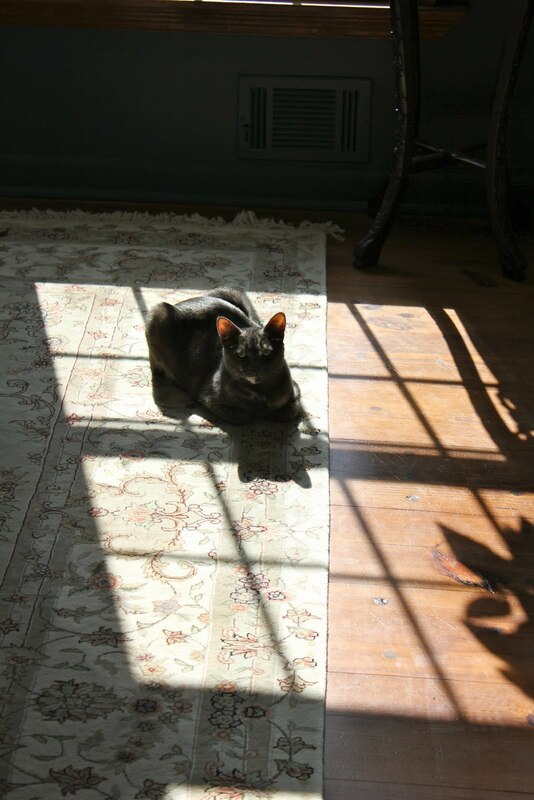 And there's something about seeing a cat soaking up the rays to make nearly any human feel warm just to watch. It's as if the cats are radiating heat thoughts. Athena, as Meatloaf, finding her place in the sun. Dawn, making sure the sun reaches kitty belly. Lest any reader of this blog wonder, let me be perfectly clear that all animals who reside in my home are provided a wide variety of designated pet beds and sleeping spots. And sometimes--sometimes--they are actually used by the designated animals: dogs in dog beds, cats in cat beds. Sometimes there’s a bit of a change-up, but everyone has comfortable places to lay their weary heads after a hard day’s bite. Jasper the Moose pours out of the small dog bed. Sweet little Lilah looks dwarfed by the big bean bag dog bed. And yes, every animal eventually winds up on the bed that Brian and I sleep in. Sometimes all at the same time. Because it is the Most Special Sleeping Space. And everyone is welcome. 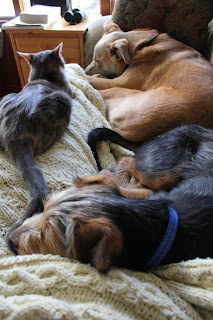 Though it's hard to catch them all in on place, here are 4/5 of my menagerie, on my bed.